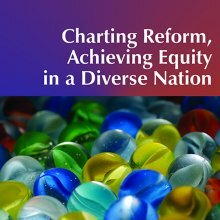 Books, edited books, and journal articles related to educational equity and opportunity. Throughout the twentieth century, local control of school districts was one of the most contentious issues in American politics. As state and federal regulation attempted to standardize public schools, conservatives defended local prerogative as a bulwark of democratic values. Yet their commitment to those values was shifting and selective. In The Fight for Local Control, Campbell F. Scribner demonstrates how, in the decades after World War II, suburban communities appropriated legacies of rural education to assert their political autonomy and in the process radically changed educational law. This book presents the evidence. Drawing on the work of the nation’s most prominent researchers, the book explores the major elements of these reforms, as well as the social, political, and educational contexts in which they take place. The weight of the evidence indisputably shows little success and no promise for these reforms. The book concludes with a review of more promising avenues for educational reform, including the necessity of broader societal investments for combatting poverty and adverse social conditions.